Watch out Windex and Lysol, there is a new non-brand of cleaner taking the world by storm. From hotel maids to housewives, people everywhere are turning to…drumroll please… WATER to clean and disinfect everything from toys to toilets. Chemically-sensitive people are raving about the cleaning ability of acid water, which can be made at home from your own tap. Don’t let the name fool you, this isn’t like the burn-your-skin chlorine type chemical that easily comes to mind. Acidic water is a powerful cleaner and disinfectant that can be made in many different potency levels, none of which are harmful. Many hospitals in Asia even use acid water for skin and wound care because of it’s disinfecting qualities. Hotel chains are even turning to this wonderful water to cut down on their chemical product bills and improve the health of their staff. This new water isn’t new, but is just being reveled to Americans because more people are now concerned with living a “green” lifestyle and not bringing more toxins into their homes or releasing them into the environment. Ruiz now has bottles of acidic water all over his home, bathroom, kitchen and even a small one in the living room. 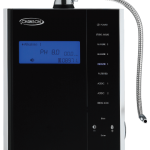 Acidic water is made from a water ionizer that is usually called an electrolizer or an ionizer. Tap water is run through titanium plates and an electrical charge is put on the water changing it’s molecule structure. Some machines add a salt solution to the water to aid in the process, but those same machines can have their warranties voided if the salt spills inside the water ionizer and damages the machines. All water ionizers make three types of water: alkaline, purified, and acidic, but some cannot make the acid water strong enough for disinfecting. A level 4 pH may kill germs after a few seconds, but a 2.7 will kill most of them on contact. Having tested machines from most ionizer companies, Ruiz notes that both the Enagic machine which adds salt and the Chanson undercounter water ionizer which doesn’t add salt make extremely good acidic water. A good acidic water will smell mildly of bleach without being toxic. The Chanson Miracle water ionizer has been 3rd party lab tested to produce acid water that will disinfect on contact.